This is the first cake I ever made! Well, that was decorated, anyway. My daughter’s first birthday cake, we had her party combined with her Dedication. 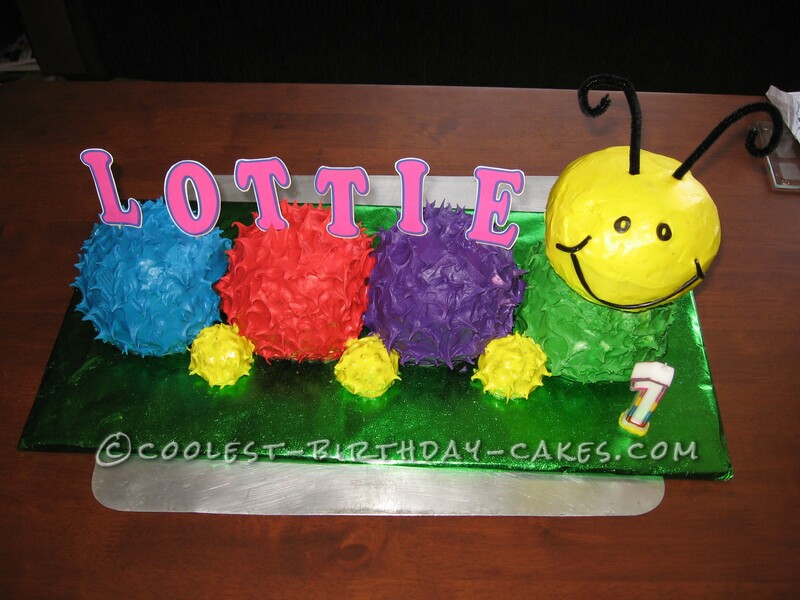 Everyone loved the caterpillar cake. My mother in law helped me bake and ice it. I probably found a picture on the internet for inspiration, being back in 2008, I can’t recall now! We used some metal bowls I found on special in a home store. We used these for baking for the chocolate cakes. I had 3 bowls to make it quicker (put them all in the oven together). The feet are just made from the same cake recipe but in small muffin tins. The head was attached with some skewers to hold it firmly in place. I used icing with egg white in it so that I could get the peaks on the ‘fur’. I used a knife to peak it. I printed out her name on the computer and taped them to toothpicks. Pipe cleaners for antennae and licorice for the mouth. A pretty straight forward cake, but I did find it stressful and fiddly being my first ever decorating experience! Especially, I think, because we had a hoard of family staying for the Dedication from out of town and a whole heap of plannning for the event. But my mother in law managed to keep me sane! Good job! I like how you did the icing with the peaks – I liked the textured look of some other cakes I saw, but they were done with an icing bag – this is much easier and looks great! I also like how you put the head on top of another cake ball – makes it look more realistic.